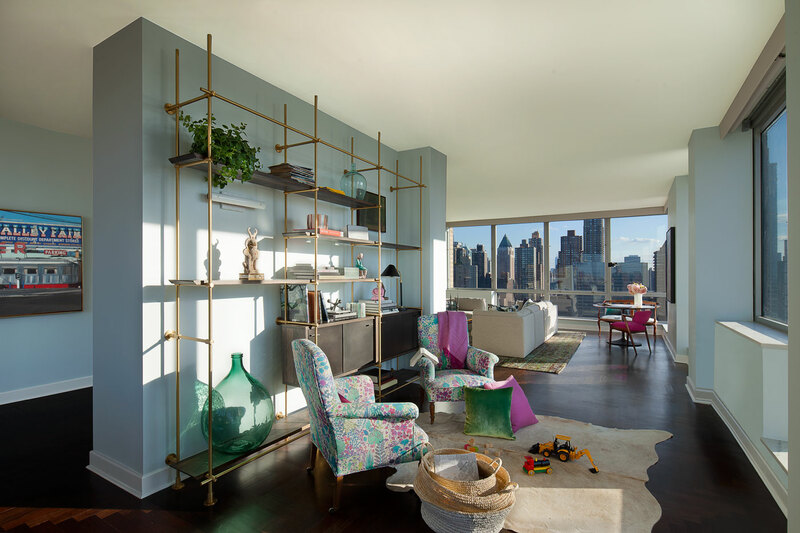 On the 29th floor of a high-rise building on the Upper West Side of Manhattan, a 2,900 SF 4-bedroom apartment was re-imagined to better fit the aesthetic and lifestyle of a couple and their burgeoning art and furnishings collection. To create a clean, spare back drop for the couple’s collection required changes to the entry hall gallery, master bathroom, kitchen and living/dining rooms. 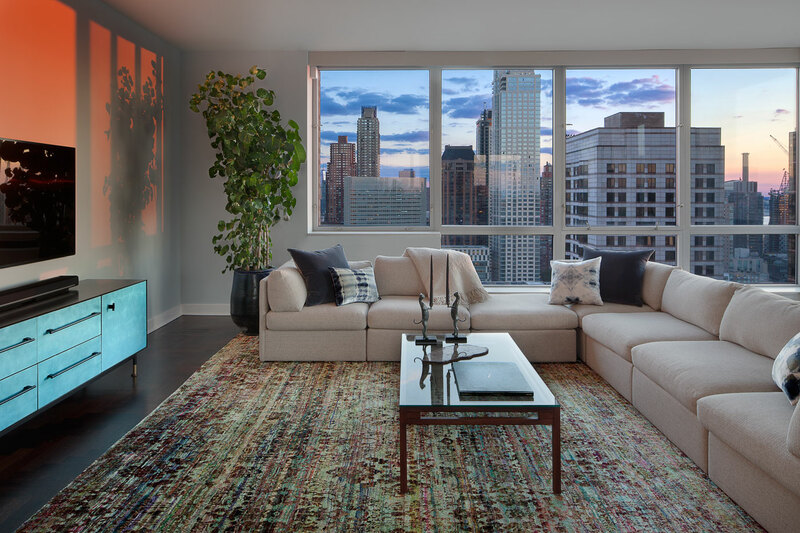 The living and dining rooms were combined by removing existing interior partitions, thus opening up the space to reveal a 360-degree view of Midtown. 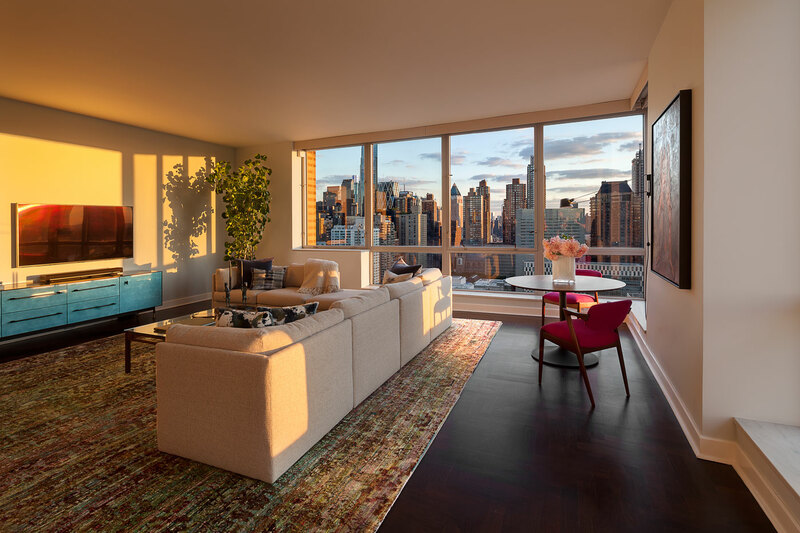 The airy, open space created by this intervention highlights the apartment’s crisp details, and swathes each element of the residents’ art collection in natural light. 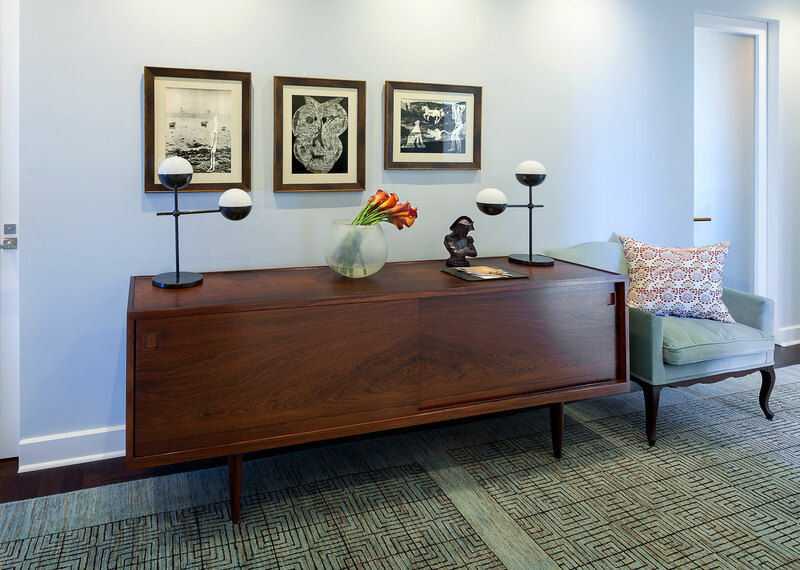 Likewise, in the gallery, new wall-washing light fixtures and the installation of transparent single acid etched glass paneled doors allow for light to illuminate what was once a dark and confined entry hallway. 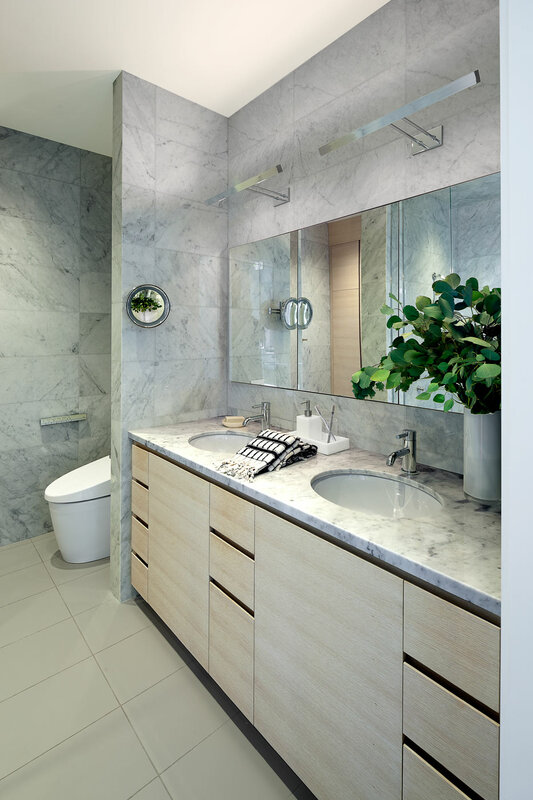 The light color palette is continued in the master bathroom, which was outfitted with white Carrara marble wall tiles and counter tops, in addition to a new recessed medicine cabinet and below-sink storage units featuring wire-brushed white oak panels with edge pulls. 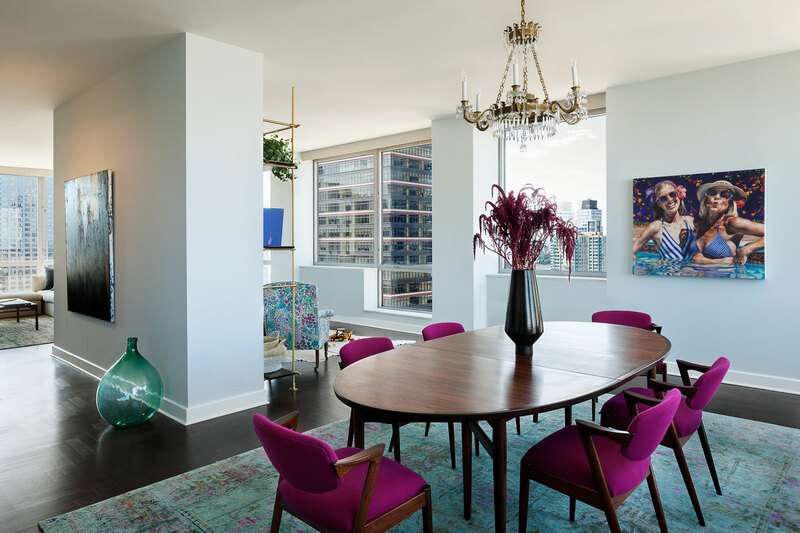 The kitchen was completely transformed – all new mahogany wood floors were installed to match the existing flooring, thus forging continuity between the kitchen and the rest of the apartment. The new design features a polished Calacatta Caldia white marble backsplash, a surface which is repeated in the countertop of the kitchen island. 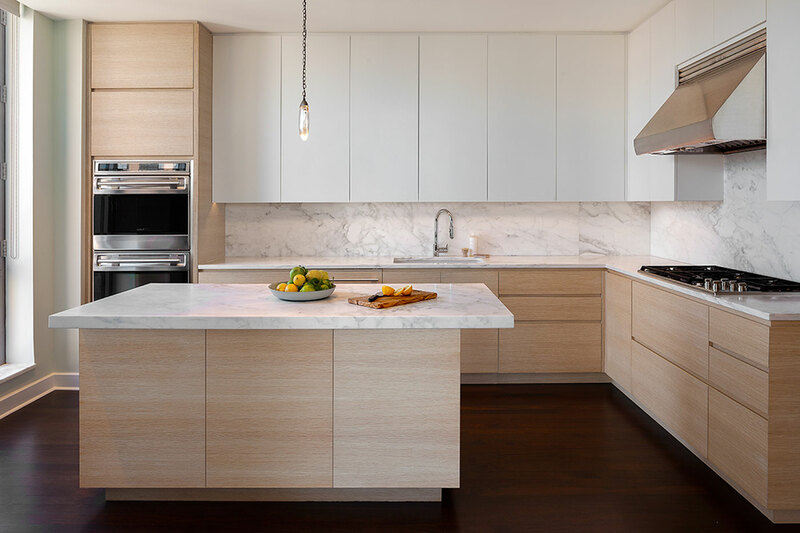 The existing lower cabinets were replaced with new crafted cabinets of natural white oak and wire brushed wood panels with edge pulls, while the upper cabinets were painted ivory white with a matte finish.